With Father’s Day just a few days away, I’ve got the guys on my mind. 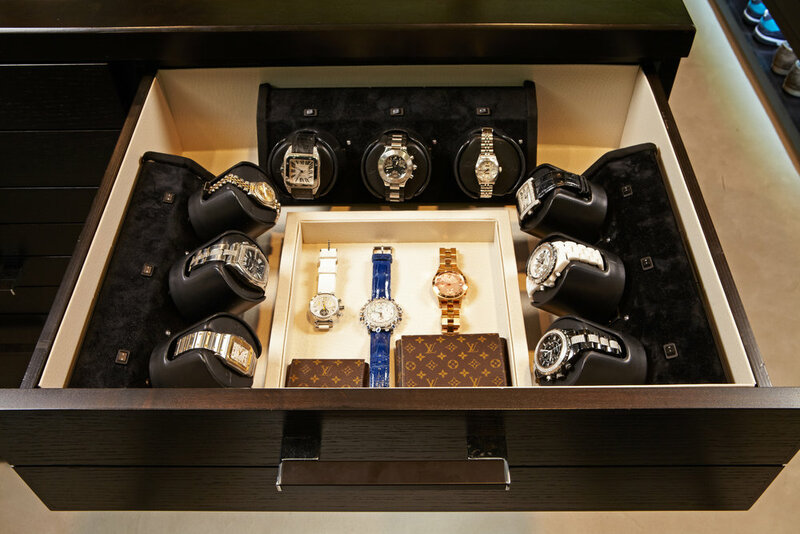 Many of my male clients inspire me with their inventive (and sometimes over-the-top) closet ideas, so I wanted to dedicate this post to dads and guys, alike. Beyond working with warmer and richer masculine materials like mahogany and leather, I’ve had a lot of fun designing dressing rooms for dudes over the years. One of my favorite Dad’s Day-worthy closets is Matt Rutler’s, whose space I designed a few years ago. Christina Aguilera’s husband wanted a place to house his sneaker collection and music memorabilia, and also wanted a fridge to stock beers to enjoy when his buds came over. In the end, we gave “man cave” a whole new meaning! In another one of my male client’s closets we designed a dressing room around his multiple collections — from a sneaker showcase to display his impressive shoes to stands for his motorcycle masks and gear to a glass display for his gadgets, car keys and pocket knives. 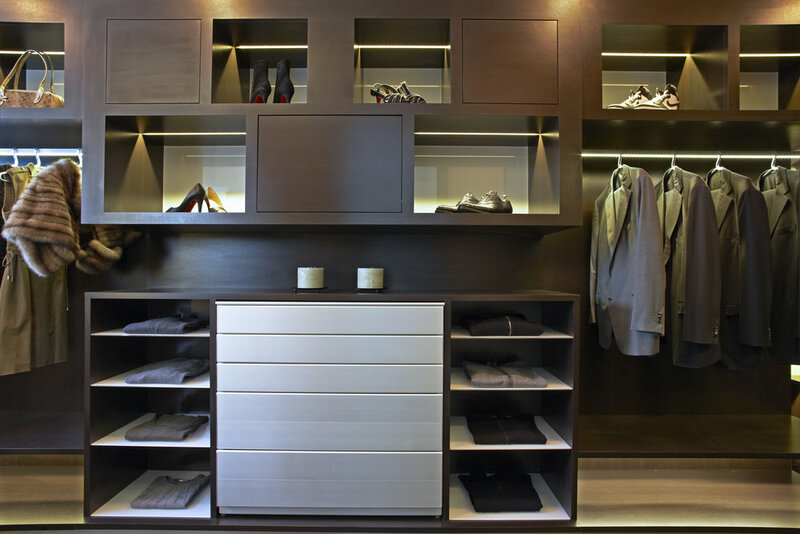 In what I like to call a “50 Shades” closet, we pulled inspiration from Christian Grey’s dressing room, incorporating a custom pant rack for men’s slacks, sleek, uniform hangers to properly display, store and preserve suits, and a custom drawer for his watch winders. I’ve also found ways to add fun elements for the fellas based on their hobbies and interests, like locker room inspired storage to hold everything from sports tees to trophies, a shelf and charging station for drones, a cocktail bar and a putting green. da Vinci mini Wireless 3D Printer -- For fathers who are early adopters, this 3D printer will keep him ahead of the tech curve…and instantly up his “cool factor” among his friends. Hublot Big Bang Meca-10 Shepard Fairey Limited Edition Watch -- Even if your dad tends to be tardy, he’ll still arrive in style with this original timepiece that’s the ultimate conversation starter. Freestanding Watch Winder -- What's better than an accessory for your accessories?! Any man with a meaningful watch collection needs a portable winder to keep everything in working order. Don't waste a second resetting your watch! LA Closet Design Hangers — Give Dad a subtle hint to tidy up his wardrobe with these stylish hangers — he’s sure to appreciate keeping his polos and ties (and “Dad jeans”!) in order. LAMove Mobile Closet -- Sometimes Pops need a little help packing. The ultimate roller bag where everything has its place, this suitcase’s multiple organizational compartments and hanging system will ensure he feels perfectly put together when he hits the road. TechLoom Ascend Shoe -- This is my favorite brand of workout shoes and I think they are great for guys, too. Whether your father is a fitness fanatic or sneakerhead (or both! ), these will ensure he puts his best fitness foot forward.